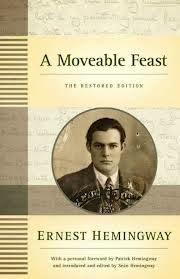 a book chick: "A Moveable Feast"
my take: This was great to read after reading The Paris Wife ... if we hadn't read that last year, we all agreed we would not have enjoyed it, or enjoyed it as much. The streets, cafes, food, and weather of Paris come to life, even if Hemingway's not able to be particularly faithful in his re-telling of certain personal events. I wish I'd read this before my last trip to Paris, which I hope wasn't my last ... I think in some circles this has been considered required pre-Paris reading. It made me want to read a bit more on F. Scott Fitzgerald as he figures prominently in many of the sketches. Some sketches are tremendous. Let's face it, the man could write even if he is a bit of an enigma.